Most canals had mileposts. We call them that for convenience but actually they were mile markers – for the calculation of tolls. 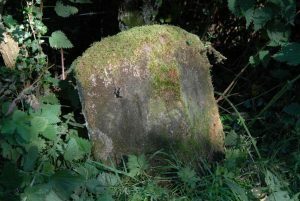 Originally The Trent & Mersey had simple stone posts; there is still one left in Weston Cutting, and at least one (on the River Churnet near Consall Forge) on the Caldon Canal. Around 1818 the company decided they wanted something better and commissioned particularly attractive cast iron ones from a company called Rangeley & Dixon (based like the canal company in Stone). They installed these posts (one assumes from the R&D caster’s mark) in 1819. 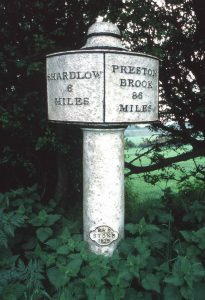 The 93 posts covered the 92 miles between Shardlow (rather than Derwent Mouth) to Preston Brook. It appears the caster’s mark hadn’t initially been standardised as the first four from Shardlow have a square shape. They stood quietly for 120 years until World War II came along. In 1940 – with the fear of German paratroopers landing, they (along with other signs) were removed. In fact instructions were first given to dig them up and turn them upside down in the holes! Then, a few weeks later, staff were told to remove them to convenient places. We know this is a fact from the lengthsman for the Fradley section who took four to his cottage garden by Kings Bromley Bridge in the iceboat. However, we don’t know that all were treated in this way, as some looked as if they had never been disturbed. [Maybe it was just where the T&M formed one of the official defence lines.] After the war many were put back, such as the one in Alrewas which had survived in Fradley Yard. However a lot went missing. 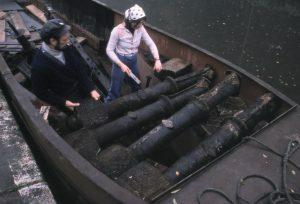 Come the 1970s – a Trent & Mersey Canal Society had been formed – initially to campaign for the reopening of Harecastle Tunnel. 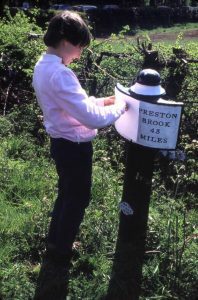 The membership secretary , Alan Bradshaw, suggested that we should do something about the mileposts. Under the chairmanship of Roger Lee the T&MCS formally started the Milepost Campaign. First we undertook a survey to find out how many were left and what condition they were in. They were painted in various liveries, one had fallen into the river (but the original milestone had survived next to it! ), some were damaged. Eventually we discovered that 33 were missing and one needed replacing (the Shelton one was dredged out of the cut but was beyond repair). So we set to concreting them in (as they were never concreted in), cleaning and painting the existing ones. The best find was in Burton. An old chap told us to have a look under the piles of junk under the road arches at Dallow Lane Lock. 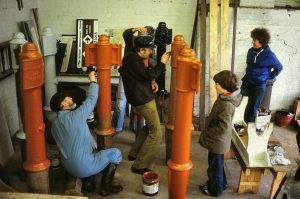 There were the four mileposts from Branston to Burton, which we brought back to Fradley where BW allowed us to use their workshop for repainting. Once repainted we transported them to the sites. Brian Haskins, BW Northwich Area Engineer, supplied us with a superb set of line plans, showing the locations. Plus, at Fradley, there was a full set of 26in/mile OS sheets of the canal showing milepost locations. In October 1978 they were carefully positioned, dug in and concreted. Then we had to tackle the missing ones. Fortunately we had a member in Stoke who was a pattern maker. He made us a new pattern and core box, which are now on display at the National Waterways Museum, Ellesmere Port. The main differences from the originals are the caster’s mark – T&MCS 1977 (Bicentenary year) – and no flange on the bottom, as they would be concreted in. The new ones are also heavier than the originals. 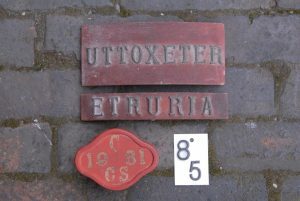 Most were cast at The Victoria Iron Works in Derby. We set about finding sponsors, which we thought might be a daunting task – but was quite easy really. We even had a queue! It was calculated that a new installation (including a commemorative plaque) would cost £250. The first post was at Stenson and was sponsored by Lawrence Sanders of Stenson Marina. Lawrence went on to eventually sponsor the next two downstream from Stenson and became the society’s President. Sir Frank Price, then chairman of BW, unveiled it on 20 September 1979. Others were sponsored by members, boat clubs, and organisations, both big and small organisations. We had all sorts of VIP unveilers, including Malcolm Braine (boatbuilder), David Wain OBE (IWAAC chairman), Sir Arthur Bryant (Wedgwood chairman), Lesley Young (new BW chairman), MP Edwina Curry, and Brian Haskins (BW Engineer). Brian unveiled the replacement milepost at the Southern Portal of Harecastle Tunnel. The original (missing) one was actually on the horse path over Harecastle Tunnel but, sadly, we had to re-site the replacement milepost for safety (but we did add an extra explanatory plaque). 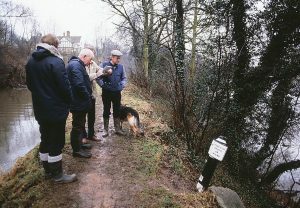 The Earl of Shrewsbury unveiled one at Stone, which was sponsored by the Canal Society of New Jersey who were knocked out by us getting a ‘real oil’. We put an extra one in at Derwent Mouth, which was unveiled by a real Duchess – The Duchess of Devonshire of Chatsworth House. However we unfortunately missed out on our greatest VIP. Lord Lichfield was invited to unveil the one at Great Haywood, but didn’t reply. Then, out of the blue, he rang up and apologised saying that he had just found the letter, and that The Queen and Princess Margaret would “stroll down and join in” as they were staying that weekend. But it was too late. We had already had the plaque made for David Wain OBE to unveil. Meanwhile – back on the Main Line – we got to the last one. Everyone offered to sponsor the last one, but we had anticipated this and the society said we would sponsor it – and we had reserved the location at Brownhills, near Harecastle, where historically the first sod of the canal was cut. As part of a big celebration, to which we invited all previous sponsors, it was unveiled with a flourish by BW Chairman Leslie Young on 27 October 1985. So the project was complete, and all the sponsors had received a superb certificate . We still get complaints that they DON’T point the way (as Shardlow is always on the left regardless of which side of the canal the towpath is), which walkers find difficult to understand. Some people appeared not to like what we had done as the top of the Kings Bromley post was hacksawed off and the plaque defaced. But they do provide a wonderful practical history lesson for schoolchildren. To round off – just to confuse everyone. In what we think were BTC days somebody appeared to have the bright idea of installing some concrete posts along the waterways around Nottingham, including the T&M. 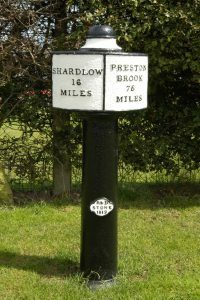 An Erewash example was later described in a waterway magazine as ‘an original milepost’.